Info "You can take this guy! He's a chump!" Punch-Out!! is one of 18-Volt's microgames in localized versions of WarioWare: D.I.Y. Showcase. It replaces the microgame Card Hero from the Japanese version, which features different gameplay. 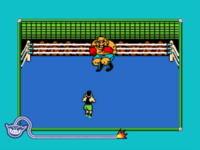 In the microgame, Little Mac must dodge Bald Bull. If Bald Bull is dodged, the player can KO him. If the player fails to dodge, Little Mac will be knocked out instead. This page was last edited on October 8, 2018, at 22:37.